You have probably seen the fruit of the Rambutan in markets, and have never really looked at it. They are best describes as red hairy lychee look a-likes. The trees are not widely grown, however the fruit is sought after. Rambutan are a tropical fruit similar to the lychee. A native of Malaysia and the Philippines Rambutan require well drained soil high in organic matter, high rainfall and high temperatures. Grafted varieties are available and these may take 5 – 8 years to bear fruit. Fruit is great fresh, simply split open and remove the red outer skin and the seed, nice with ice cream, mango, yoghurt or use to make an interesting jam. One of the problems with commercial production, is that the fruit need to be harvested when ripe, this presents some problems with transportation and storage. 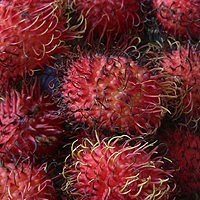 Rambutan trees are strictly a tropical fruit tree and although they will grown a range of conditions, proper care will ensure good fruit production. Soil. A deep loamy soil that is well drained is ideal. Poorly drained or water logged soils are not suitable. Watering. Consistent moisture through the year is important, irrigation may be required in some areas. Varieties. Choose a recognised grafted variety as seedling trees are unreliable for fruit production. Tree spacing. Current practice is for reasonably dense plantings. New planting are usually grown under shade cloth. Fertiliser. Fruit production will be improved with regular applications of fertiliser. High Nitrogen fertilisers are recommended. Pruning. Common practice is to prune tree from an early age. Climate – Tropical – Limited to Northern Queensland and areas of the Northern Territory for good fruit production. Height – Generally around 10 metres in height, in ideal conditions up to 18 metres. In commercial fruit production, Rambutan trees are kept pruned to around 4 metres in height for ease of harvest and better fruit production. Soil – Humus rich well drained with good moisture. Fruiting time – This will depend on location, from winter to summer.